When viewing any question, it would be nice to see the total number of votes as a little tagline underneath the total vote score. You could show the individual up/down totals (+12, -15) but I thought a simple total might be somewhat cleaner. The total vote count (score) is denormalized, but the individual up/down vote counts are not. So to display it on every post would incur 2 vote table queries * number of visible questions / answers. Our DB is fast, but the vote table is pretty massive, and not doing a query is always faster than doing it.. It's possibly something we could do on demand (as @hmemcpy notes), but as an "always displayed" it is a non-starter. EDIT: Jarrod implemented displaying total up/down votes today. This is currently deployed to meta and will be deployed to other sites in the evening PST later today. Simply click on the vote number itself to show up/down vote totals. Requires 1000 rep.
An unobtrusive way of showing the information would be as a tooltip, shown when hovering over the score (or perhaps the up/down arrows). However this wouldn't work quite well here, so perhaps show this in a tooltip over the number, as Jonik suggested. Moderators and 10K rep users get access to the vote velocity, or the amount of upvotes and downvotes for a given question. Performance hit for providing that information for every action request on the site. To not 'encourage' excessive voting (both up and down) for a topic. Because it's not really 'important' across an aggregate context. 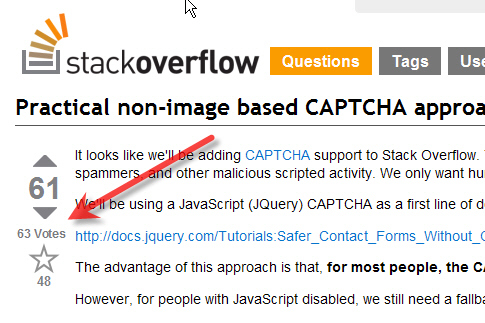 I've created a UserScript/bookmarklet which enables this feature for all Stack Exchange websites. If you don't have sufficient reputation, let alone an account, you will still be able to view up- and downvotes. For more details, see "View Vote totals" without 1000 rep. If you're not interested in details, but want to use the script right away, have a look at GreasyFork.org. It might make sense to show it on a users own question, since they basically can see this information by the reputation they gain/loose. I'm not really sure what you gain by having the information easily visible, since it could be misleading (say if a question was crappy, so it was down-voted, edited then voted back to a positive number). I think the final score is all that really matters..
Not the answer you're looking for? Browse other questions tagged feature-request status-completed voting user-interface . What happened to the “Return to answer” link? Why is it a privilege to view vote counts?